For years, prosecutors for Immigration and Customs Enforcement had the discretion to drop cases against low-risk or otherwise law-abiding undocumented immigrants. The process, known as “prosecutorial discretion,” gave a second chance to those with a path to citizenship like a marriage petition or a visa application, and allowed ICE lawyers to focus on violent criminals. Not anymore. Those second chances have all but disappeared during the past six months of the Trump administration, according to ICE data obtained by VICE News. At the same time, ICE has ramped up immigration arrests of non-criminals who were considered low-priority under the Obama administration. Department of Homeland Security data analyzed by the Transactional Records Access Clearinghouse at Syracuse University shows that “prosecutorial discretion,” once used in thousands of cases a month, has dwindled to a few dozen. 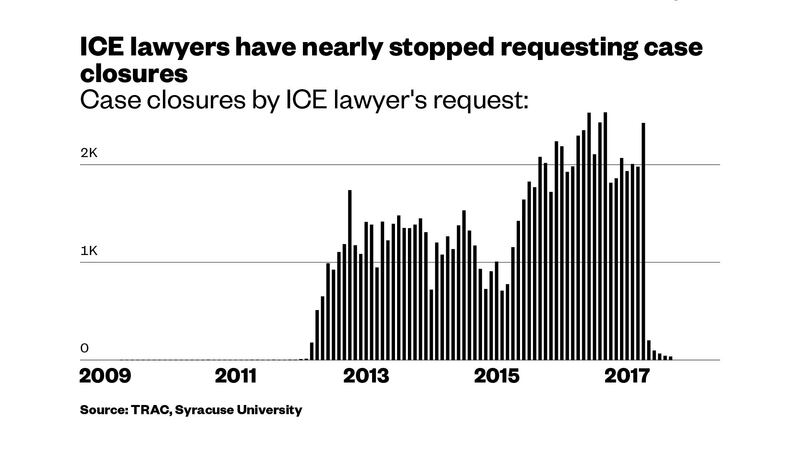 The number of cases closed by ICE lawyers’ request plummeted from 2,425 in January of this year to 199 in February, and further to 34 in June. That means more than 2,000 immigrants who would normally have had their cases closed are now stuck in removal proceedings. Arrests of non-criminals have increased during the same time period, up from 1,730 in January to 4,176 in June, according to ICE statistics. A spokesman for ICE told VICE News the department still reviews all cases for prosecutorial discretion but no longer exercises it, even in cases where an immigrant’s only crime is breaking immigration laws. The policy shift happened with a memo from ex-Secretary of Homeland Security and new White House Chief of Staff John Kelly in February. It essentially abolished prosecutorial discretion for previously low-priority immigrants and the priority system. The new policy, a stark shift from the Obama administration, has led to greater media attention around aggressive ICE tactics as immigrants once considered low-priority are prosecuted for deportation. A woman in Boston was arrested at her interview with Citizenship and Immigration Services, part of pursuing her green card application with her U.S. citizen spouse. A Cincinnati man was arrested in the hallway right after his marriage petition interview. A Sacramento man was arrested at an immigration check-in. A Denver man was arrested by ICE at the local courthouse when he showed up to resolve a misdemeanor traffic violation. A woman in El Paso was arrested in the courthouse hallway after she attended a hearing to get a restraining order against her abusive partner. A DACA recipient in Seattle was arrested during a home raid. ICE officers were looking for his father but arrested him in the process. A high school soccer player with a college scholarship was arrested when he showed up to a Maryland ICE office for a check-in with immigration officials. A Los Angeles father was arrested after he dropped one of his daughters off at school. His other daughter filmed the arrest from the back seat. A father in Connecticut was arrested when he went to a local ICE office to sign some papers for his undocumented son. While the shift in policy has been stark under Trump, it is not too dissimilar to the early years of the Obama administration when ICE took a tougher line toward otherwise law-abiding immigrants. “From 2009 to 2011 it was the same kind of enforcement we’re seeing now,” Fresco said. More people were deported from 2009 to 2011 than during the eight years before Obama took office, according to ICE statistics. But with his 2012 reelection approaching and having made no progress on his campaign promise to reform the immigration system, Obama decided to change immigration enforcement policy in 2011. Then-ICE Director John Morton issued a memo urging immigration officials to consider many factors — including family ties to U.S. citizens, criminal history, and community engagement — when deciding how to handle arrests and removal orders. “That was the first step in terms of saying we’re not going to go after people who are here illegally but haven’t done anything else wrong,” Fresco said. After the memo, the number of cases removed from immigration court using prosecutorial discretion — ICE lawyers requesting that low-priority immigrants be let go — began to climb. Less than one case per month was closed this way before the memo in June 2011. In December 2011 there were 177 cases closed. By the end of 2012, immigration officials were closing around 1,500 cases per month. In an effort to further define who is a priority and who is not, ICE leadership issued another memo in 2014 directing immigration officials to prioritize violent criminals specifically, and advising against prosecuting people who had been in the country for a long time. Even with these directives in place, low-priority people were still arrested at sensitive locations like courthouses or marriage interviews and sometimes found themselves in front of immigration judges. But, according to immigration attorneys, ICE lawyers were much more willing to negotiate and let low-priority people go. Lawyers would often bring sympathetic cases — family breadwinners or newlyweds — to ICE lawyers and ask them to explain why they were continuing to prosecute them despite the priority system. “It was about shaming the government. Now the government is shameless,” said Alan Diamante, a lawyer in Los Angeles. The pledge to prosecute every single immigration case means that case backlogs at immigration courts, which expanded 130 percent under President Obama, will continue to grow. Cases for immigrants with no criminal history, including those who have a way to legally change their status from undocumented to documented outside of court, will instead wait on a judge’s docket for years. The average wait time for an immigration case to funnel its way through the system is now nearly two years, compared to around one year in 2009. Aggressive arrests of people previously considered low-priority and the limited options for those arrested are causing paralyzing fear in immigrant communities. More immigrants are leaving their jobs, afraid to show up to school, and inquiring about relocating to Canada, according to attorneys and advocates.